Social media platforms like Facebook and Twitter have been around for quite a few years now. Since their launch, they quickly grew to become the modern marketer’s preferred channels to reach out to and engage with their audience at scale. With several tactics that can be used in both paid and non-paid forms of social media marketing, they do hold great potential in helping a business establish itself as a brand. And yet, only a few businesses are able to use these channels effectively. 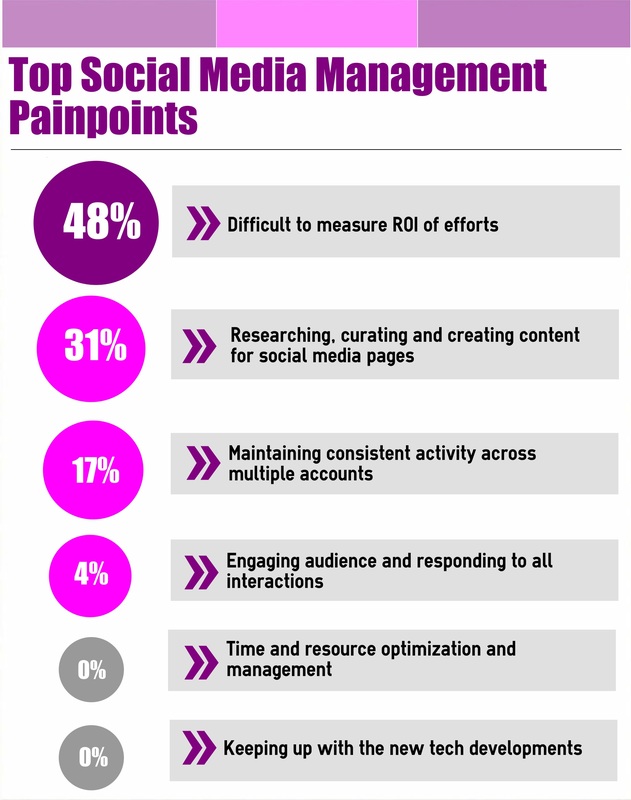 What is your top social media management painpoint? 48% of the respondents said that their biggest challenge lies in measuring ROI on their social media marketing efforts. And 31% said they had difficulty in researching, creating and curating content for their social channels. Despite the wide array of analytics tools available, measuring ROI can be tricky. Sure, you can get a count of the number of likes or views on a post; measure the Click Through Rate (CTR) and even track some advanced metrics such as Time Spent On-page. But it’s still difficult to determine how many of your followers are buying your product or service. In the words of Jay Baer, for every smart business, “The end goal is action, not eyeballs”. Delving deep into social media analytics will perhaps help address the problem to some extent. However, time, effort and know-how become limiting factors, particularly in the case of small businesses that don’t necessarily have social media management expertise. Apart from understanding how social media impacts their bottomline, we also found that a common challenge businesses face is content management. To keep their audiences engaged businesses must continuously create, curate and share great content. Before you decide on which metrics you should track, set your social media goals. For instance, do you want to simply increase awareness of your brand, or build an active community? Choose your platforms carefully. Not every social media platform suits every business. You should be where your audience is. Track your social media campaigns to review results and when necessary, re-align your strategy with your goals. Find your golden ratio of content sharing. While some recommend the 5:3:2 rule for content sharing, others prefer the 30/60/10 mix. There’s also the 40/60 rule. Curate more than you create. It helps you save time and stay active on social media all at once. Use social automation to discover great content in less time. With the amount of content being shared online, it’s easy for your updates to go unnoticed, or get lost in the noise on social media. While creating original content continues to be a challenge, content discovery tools help you manage both your time and your content more effectively, ensuring that you curate and share fresh, relevant and highly engaging content. This article was written by Vasudha Veeranna from Business2Community and was legally licensed through the NewsCred publisher network.